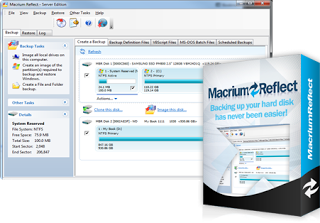 Macrium Reflect Professional Edition is a practical solution for backup and recovery. This advanced and reliable software created to help users to make backup copies of files and drives, as well as disk image files. Macrium Reflect gives ultimate protection to your personal documents, photos, music and emails. Upgrade your hard disk or try new operating systems knowing that everything is kept safely in an easily recovered backup file. Macrium Reflect supports backup on USB and network, local units, as well as burn them on all DVD formats and helps in createing backup copies of files and folders and mounted them as a virtual drive in Windows Explorer.